One of the really neat things about living the liturgical life, is that after awhile, you start to have favorite traditions and ways of celebrating that are unique to your family, and you find that your children look forward to them as well. 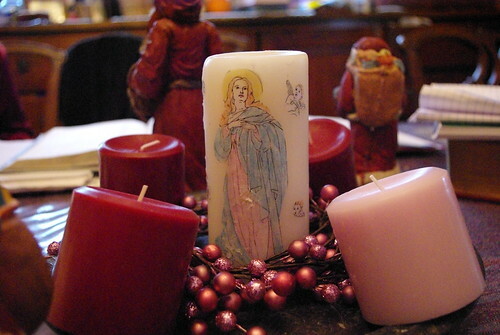 Celebrating the Immaculate Conception is one of those traditions! I found the statue above at an estate sale and got it for around $15 dollars. The flowered wreath around it came from photographer friend of Mr. Pete, who is paid to photograph flowers for advertisements. 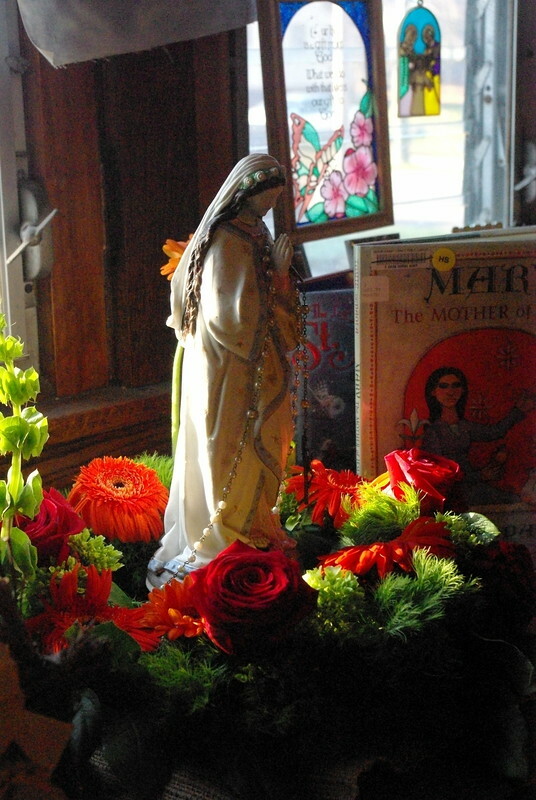 When he's done he just throws them away, but Mr. Pete got to bring this home , and so it decorates Mary's statue for this feast day. 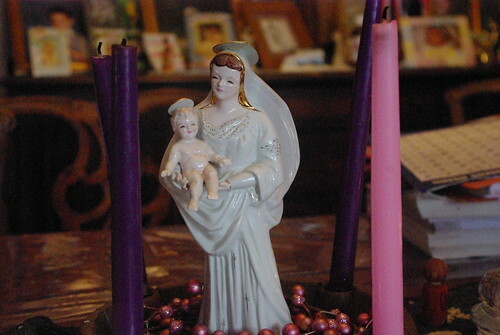 This lovely statue of Mary and Baby Jesus in the center of our advent wreath. This statue belonged to my grandmother. The halo has been glued together because at one point, I'm sure my sister or I decided to test its strength! But it's still a lovely piece and I remember looking at it in my grandma's china closet when I was little, and pondering how beautiful Mary must be in real life! On this feast day in the past, we've had a "white dinner" in honor of Mary. White of course, emphasizes Mary's pure soul and freedom from sin. 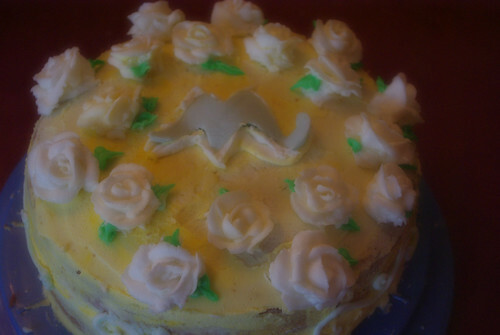 We usually have something with a white sauce like chicken with mashed potatoes and of course a white cake with white frosting! This emphasizes the point we are trying to get across about Mary to our children, but it also makes for a memorable dinner and something they can look forward to. This is a little trickier now that I am on a grain-free diet, but grilled chicken or white fish still meet the "white dinner" requirements and my family enjoys them as. But even in busy families with small children, when it's hard to do anything extra, the main thing is to get to mass today! This year the girls, including Miss C. will be attending a daytime mass on the feast day. But it's really important to go - today is one of the few Holy Days of Obligation left in the US. 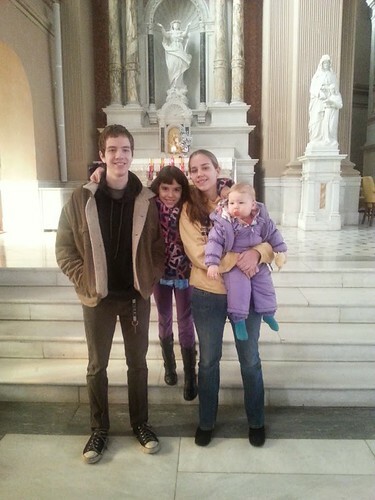 Attending mass with family is what the younger children will remember. Hopefully, the little one will have memories of attending mass with her grandmother and her aunts one day. Many times on liberal Catholic or anti-Catholic forums, Mary's Immaculate Conception will be debated because it was not claimed until 1854. Of course, any serious student of Catholicism will understand that the church only proclaims what has been held and taught centuries. I don't understand why so many of these folks have a problem with Mary being saved from original sin and remaining sinless throughout her life! Mary herself says that she was saved. Her Salvation was handled differently than the rest of us, but she still depended on God to Save her. God calls throughout the scriptures for his people to become and remain holy!! It makes sense to me that He would choose His own mother to be his perfect creation as an example to us of what that looks like. Holiness is simple. It is lovely. It is humble. It is helpful. It is obedient, kind, and caring. It says yes to wherever God calls. It does not rely on its own understanding. That is all Mary. Some good links for in Diigo File.